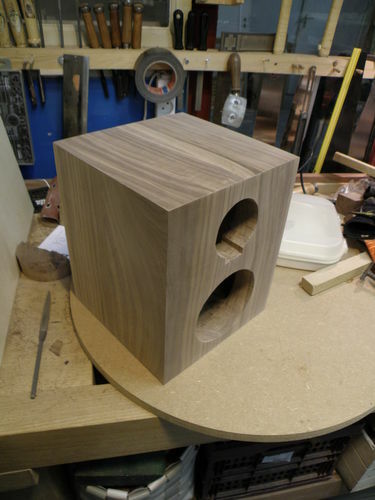 I made these 2-way speakers, wanted to try the Walnut look for a while now. I purchased a second hand b&w cc6 centerspeaker, and took the woofers-hardware from it since i was very impressed with the sound quality in the oak speakers. Glued everything with titebond 3. 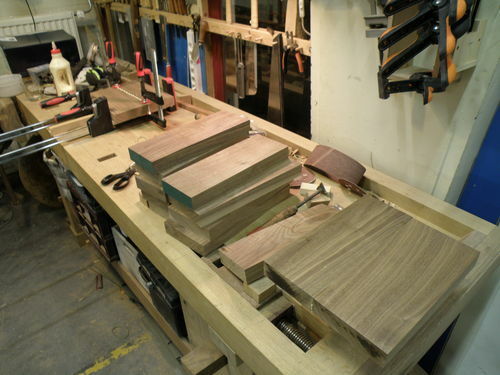 I used biscuits one the miters to prevent sliding of the sides with the glue up. 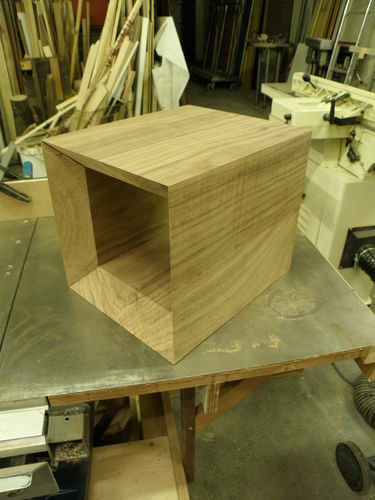 When i glue the frame up, i first coat the top and bottom 8 miters with glue, let it soak in a little ,because it´s all endgrain here it absorbs it very quikly. 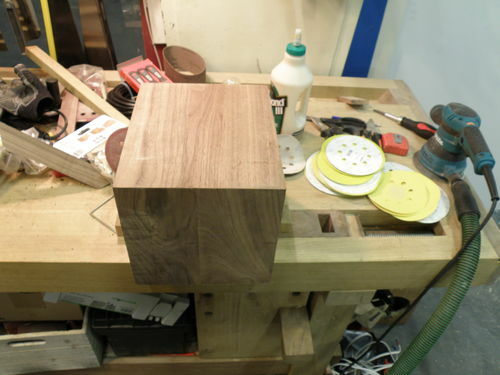 Then when it´s tacky, apply some more glue before clamping on the top and bottom. 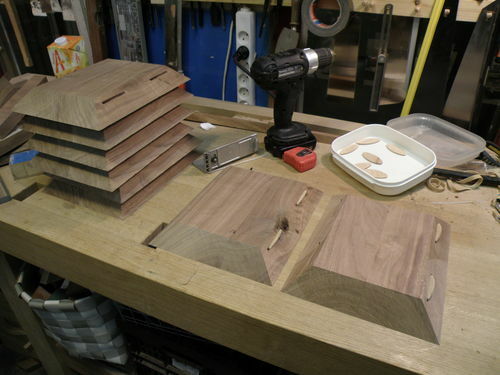 Instead of machining everything ahead, I also wait with cutting the top and bottom to size after i glued up the frame. Because the 2 are not 100% the same size around. 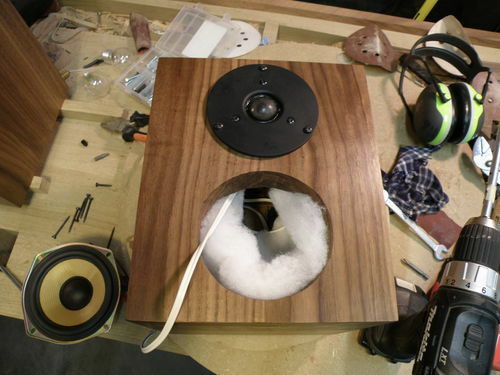 Two of my favorite things…walnut and b&w speakers…nice work. Those look awesome! I have been thinking about doing this. Everything has gotten so freaking small that there is nothing left in houses other than TVs and couches! 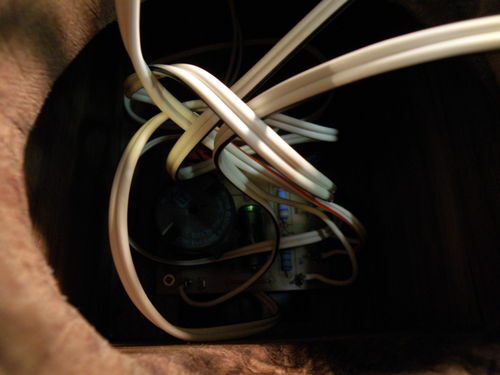 The speakers are nowhere to be found, and I kind of like seeing speakers as furniture. Does the solid wood affect the sound? How do they sound in action? 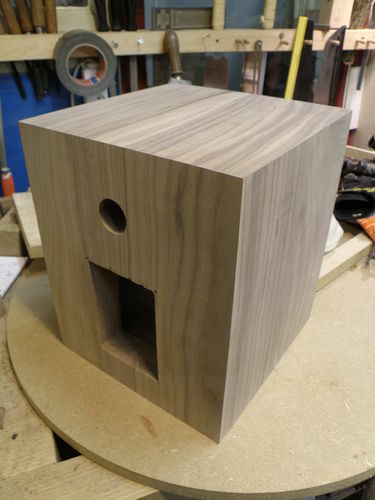 For the best sound you need to use MDF as it doesn’t resonate and color the sound. I made my first set of speakers over 40 years ago and haven’t quit yet. 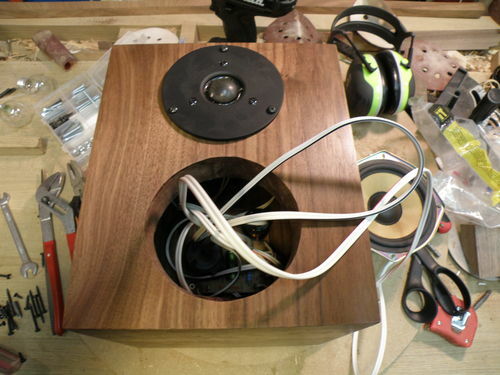 My computer speakers are made with Tangband drivers in MDF enclosures. 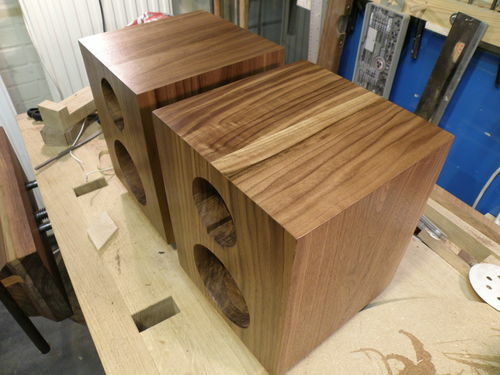 Then I threw on some cherry veneer and they turned out gorgeous and sound spectacular! You put a lot of work into yours and your craftsmanship is top notch! After your cabinets are made tap on the sides with a non-marring hammer and listen to the pitch or the “ringing”. That is the resonate frequency and whenever your music program hits that frequency it will be artificially amplified, coloring the sound. Good luck with your future endeavors! Nice tight mitered joints! 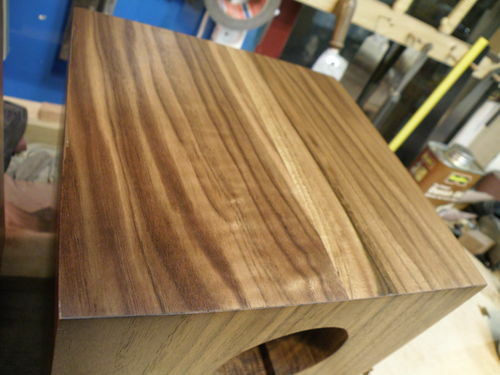 I have some walnut veneered speakers which I’ve had for 40 years! Use to be a geek before there were geeks LOL. Before mdf there was particle board. 100 watts was really that! I’m using ear buds now! They are easy to carry around! LOL! Awesome job. that’s some serious thickness. I like to see the guys at DIY htguide argue resonance due to solid wood with these . I just finished two sets myself. towers and shelf both walnut.yellow etons and yellow focal. Is that scan speak and focal? 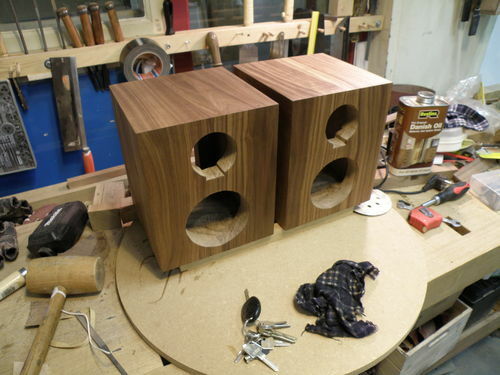 From the first pic, Looks like ya need to make a work table, LOL Nice looking work, hope they sound as good as they look. I been wanting to make something for the shop, its where I can turn it up and not be bothered. Nice looking speakers Thomas. I’m sure they sound as good as they look. That is fantastic work Thomas. 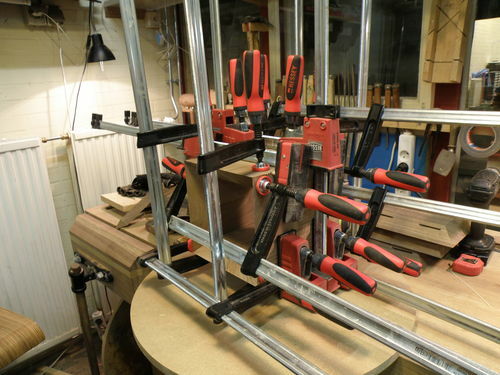 I love pic 4 with the 16 clamps on one box. I think we can all relate to that. 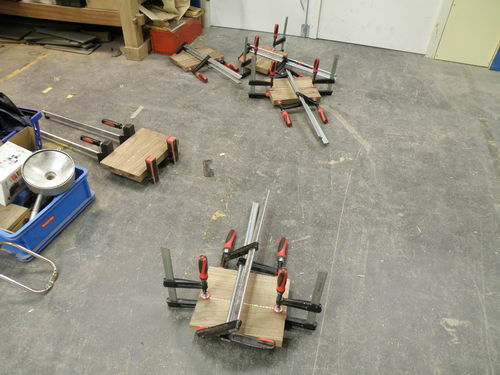 If I just had one more clamp…. The joints on your walnut ar super. Cheers to you. Thanks alot everyone! :)They sound good, still listening to see what could be improved :) Beeferer Thanks for that info! really helpful. the only way to improve is to measure. use Arta labs. Nice. Good pics. I wish I had your clamps and space. Excellent work. 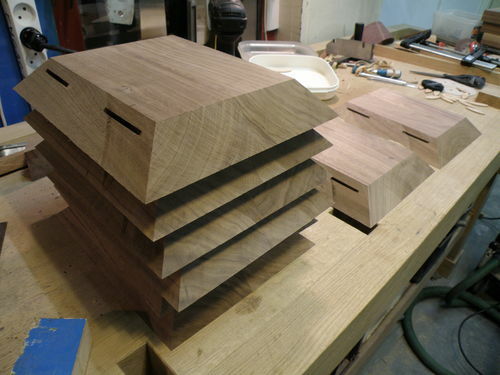 I’m really impressed with those 3d miter joints. I hope that they sound as great as they look.